Your comments about Ms. Mattie were very sweet, she was so extremely special to me and I’m glad that you enjoyed the story.. So I thought I would keep this Louisiana train running and tackle the Beignets.. Or squares as my ninth ward friend calls them.. They're the one thing Ms. Mattie didn’t show me how to make. .
Beignets are basically fried dough that is covered in powdered sugar..
Let’s travel down the Bayou where the shapes of theses confections are everything other than the squares you wait so patiently for at Café Du Monde..
Like most traditional recipes the beignets history and taste vary from region to region. Ms. Mattie called them “fritters” and formed the dough into wild, stretched shapes before frying them. (Never squares) She also never used yeast. They were much crispier and we always ate them with fig jam rather than powdered sugar. My dear friend from Thibodaux, let’s her dough rise, then shapes it, only to let it rise again. Her beignets are the best I’ve ever had. The dough soufflés, with a hollow inside and crispy edges, then she throws them in a colander (still hot and dripping with grease) then in a bucket of powdered sugar (yes a bucket), rolls them around and puts the entire colander of sugared beignets on the center of the table..
Sheer amazingness.. Let me tell you.. 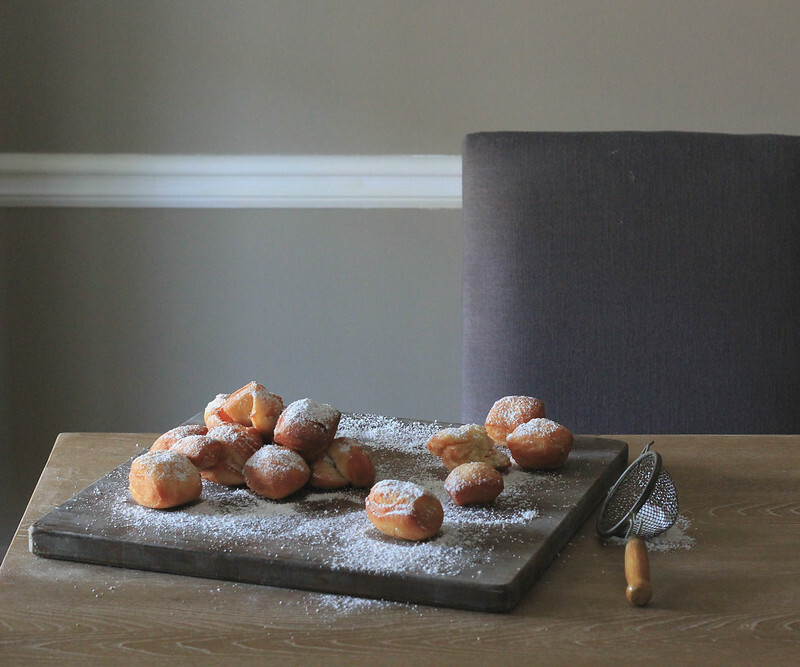 In my experience, the best beignets are found on someone’s dinner table or church festival. Rather than fancy eateries and coffee stands in the French Quarter. This recipe I adapted from my dear friend, using duck fat rather than lard and adding a bit of ground cayenne. 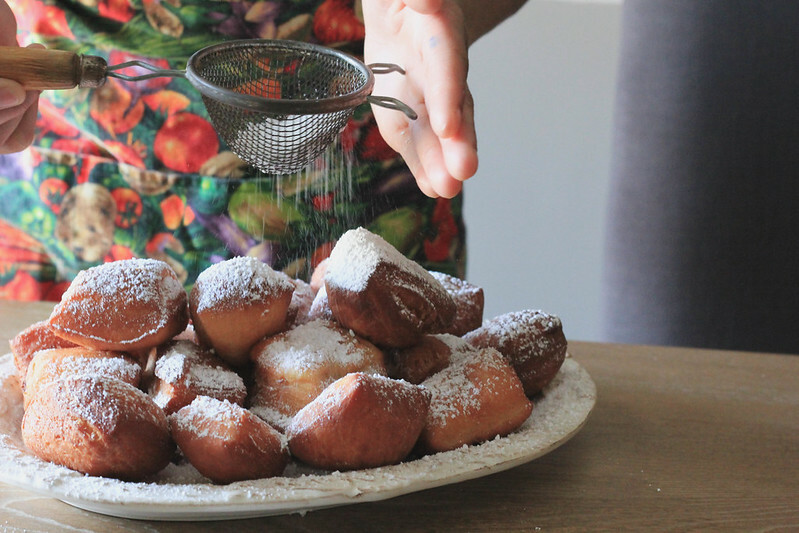 They turned out fluffy and thick, instead of the hollow beignets that some favor. There was still that crispy edge that makes my mouth water and of course powdered sugar tops. Is freezability a word? I'm getting the little red squiggly lines..
I’ve obsessed a bit over the use of duck fat, adding it in when a recipe calls for lard or shortening to see where it takes me. So far the results have been outstanding. On poultry it’s added a rich flavor and crispy golden skins. 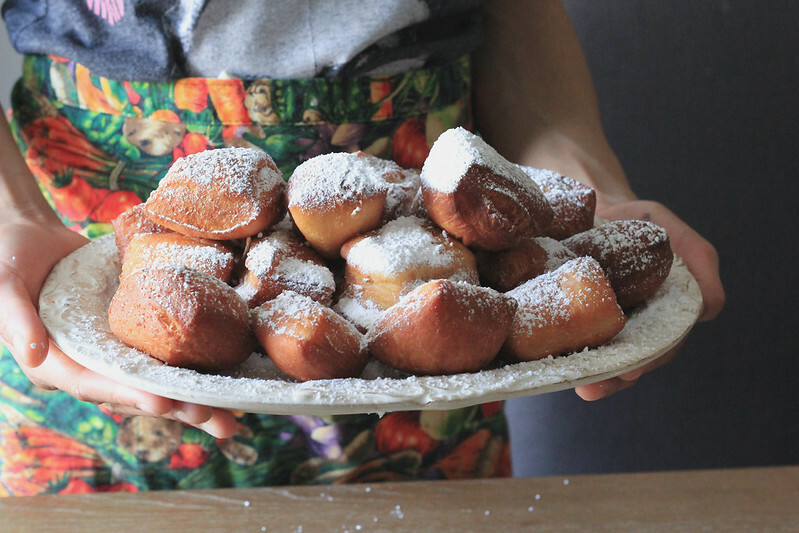 For these beignets, the duck fat gave them a tender flaky center along with that golden crust. The spice from the cayenne is subtle but it’s there. If spice ain’t your thing, you can eliminate it all together.. I adapted this recipe from my friend Lynda and the addition of cayenne from John Currence's Pickles, Pigs & Whiskey which I highly recommend. In a large bowl of a stand mixer, combine water, yeast, and sugar and allow to sit until frothy. About 5 minutes. Then add in the eggs, salt, cream and milk. Mix on low speed, then add 3 cups of the flour and the cayenne until the dough starts to come together. Now add in the duck fat, when the fat is incorporated start adding in the remaining 3 cups of flour. Add a little at a time until the most of the flour is incorporated. Remove the dough and turn out onto a lightly floured surface. At this point you will need to knead the dough much like you do for bread. The dough will be sticky so add flour to your hands and more to the surface (if needed) to get your dough smooth. Place the dough in a well-oiled bowl and cover with plastic wrap or a kitchen towel. Let rise in a warm place for at least 2 hours. 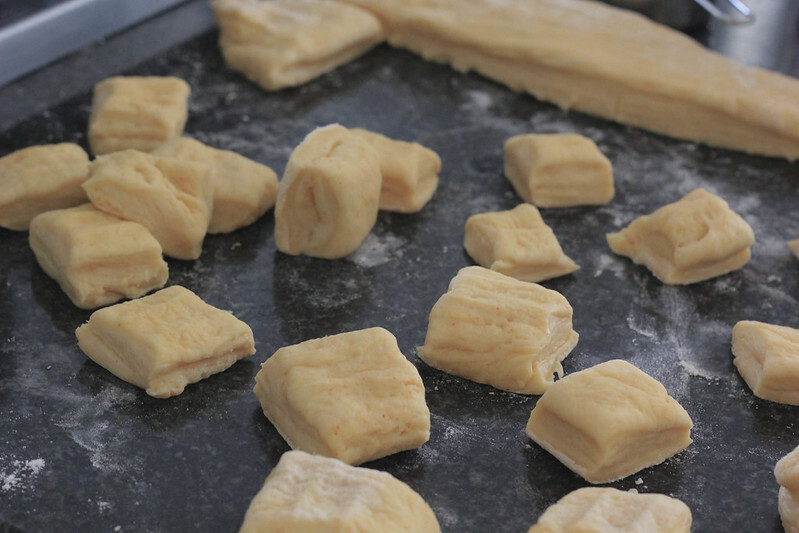 Now cut the dough into strips using a sharp knife, then cut each strip into squares. I made mine a little smaller than usual. But I skipped this step because I’m impatient. So after you cut the squares. In a large saucepan heat 2 to 3 inches of peanut oil to 350 degrees. Place 2-3 beignets at a time into the hot oil. If the beignets don’t float to the top, your oil is not hot enough. Deep-fry each beignet, flipping constantly until they are golden brown. Drain them immediately on a paper towel after removing from the oil and dust heavily with powered sugar. Or drop them in a bag (or bucket) of powdered sugar and shake to coat evenly. Make sure you have lots of napkins.